The incredible blend of proprietary ingredients or rare natural extracts in a skin care product is meaningless if the formula that contains them isn't absorbed well by the skin. Without proper absorption, those healthy ingredients stay trapped on the surface of the skin, where they can affect only the cells that are already dead and are just waiting to be shed through your body's natural turnover process. The Celazome skin care collection differs from others on the market due to its incredible nanosphere technology, which delivers ingredients deep into the skin tissue, where they can create real results for the complexion. Thanks to nanosphere technology, Celazome skin care products are 75 times more concentrated than other skin care formulas, making them better able to nourish and heal the complexion. The tiny capsules that contain the ingredients also slowly release them into the skin for benefits that continue for hours after application. Clinically tested and proven to be better at treating conditions like signs of aging than ordinary products, the Celazome formulas use the latest science to safely beautify the skin. Founded just before the turn of the new century, Celazome is dedicated to the goal of improving the quality of people's lives through advanced skin care management, backed by pharmaceutical standards of scientific research. As an acknowledged leader in nanotechnology, Celazome offers its patented Lymphazome® system to deliver pure, bioactive ingredients into skin tissues, for effective improvement in skin condition. This technology, created after years of research in their on-site laboratories, uses lecithin microbeads only 1/50th the size of human skin cells - small enough to be absorbed deep into the skin tissues - to create long-lasting benefits for skin care. The formulas are so effective that results can be astonishingly fast, often visible in two weeks or less for most people. Celazome products are available in a wide selection, to address specific skincare needs as well as in balanced, multi-step care regimens. They provide high concentrations of carefully researched, selected and sourced ingredients. These concentrations - are often in strengths up to 75 times greater than those found in other lines of skin care products - to ensure fast and effective improvement in skin condition. The formulas are never tested on animals, but they are subjected to clinical tests to ensure that they meet the highest pharmaceutical standards of safety and efficacy. The high quality of the ingredients and manufacturing techniques ensure that the products remain stable and effective for two years after the date of production. The Celazome family of skincare products are used and recommended by dermatologists, plastic surgeons, hospitals, aestheticians and spas worldwide. Skin care science is constantly evolving as new technologies are discovered to enhance the potency and effectiveness of products and treatments. One of the latest innovations is nanotechnology, creating products that contain tiny molecules that penetrate the skin more easily without sacrificing effectiveness. For more than 13 years, Dermazone Solutions has been developing its nanotechnology and has created a revolutionary method of delivering ingredients called lyphazome natural nanospheres. Found in all of Dermazone's Celazome Products, these nanospheres are one-fiftieth of the size of a human skin cell. This allows the ingredients in Celazome Products to actually permeate the cells and deliver vital nutrients to the structures within. As a result, Celazome Products offer incredible results for a variety of skin care concerns that simply cannot be matched by other products on the market. Discover what a difference nanotechnology can make for your complexion by exploring the revolutionary Celazome collection today! With their patented lyphazome natural nanosphere delivery system, Celazome Products offer incredible results for a variety of skin care concerns from combination complexions, to acne breakouts to faces marred by fine lines and wrinkles. This technology allows the high quality ingredients in the products to fully penetrate the skin and enter the cells to reverse damage and hasten healing time. The Celazome Rosewater Clarifier helps to normalize your skin by balancing the acid-base levels of the tissue through a blend of rose centifolia water and birch leaf extract. With regular use, the clarifier can eliminate patches of dry skin and oil and is safe for all skin types. Gentle enough for use on even the eye area, the clarifier also doubles as a makeup remover. Because of its unique lyphazome delivery system, the Celazome Moisturizing Sunscreen SPF 30 offers protection from ultraviolet rays that is 30 times more powerful than the natural defenses of the skin. The waterproof formulation remains potent and protective for a full eight hours and is enriched with aloe vera extract to soothe irritation and moisturize the tissue while preventing sunburn. 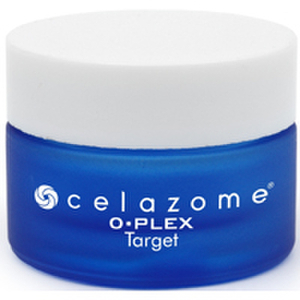 Apply the Celazome O-PLEX Target to acne blemishes anywhere on the skin and let the powerful effectiveness of lyphazome nanospheres go to work to heal and clear up your complexion. The spot treatment contains origanium complex to eliminate the bacteria that causes infections in the pores as well as sulfur and natural tea tree oil to reduce redness and soothe the skin.